The name of the medieval hamlet of Highgate comes from the Bishop of London's toll gate on top of the hill. By the 18th century the place had found favour with aristocrats and rich city merchants who were eager to escape the dirt and noise of the expanding City of London. 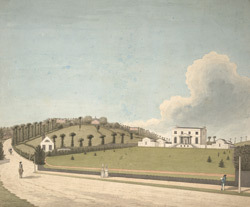 A number of mansions were built, such as the one seen here, although it was considered more desirable to be located on the top rather than the bottom of the hill.